IGIS is excited to be working with 3D Robotics (3DR) to explore new applications of small unmanned aerial systems (sUAS) for monitoring agriculture and natural resources. This technology has never been more practical for scientific exploration; however, there is still much to be learned about how to best utilize sUAS in this way. DEM from drone flightIGIS is now developing protocols for safe and efficient deployment of a 3DR Solo sUAS. Equipped with a common 12 megapixel GoPro Hero camera, this platform can survey up to 75 acres, at 3 inches of spatial resolution in less than 20 minutes, while flying a pre-defined flight path at 23 miles per hour, at 300 feet above ground level. 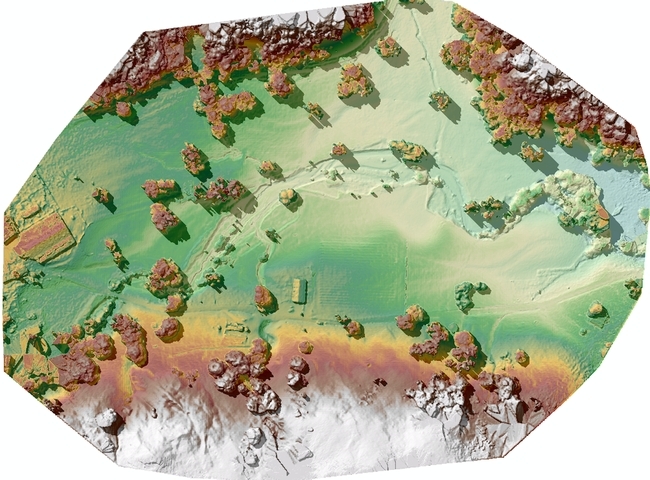 Then thanks to Pix4D mapping software, which is used to combine the pictures collected by the sUAS's GoPro into a single image mosaic, automated photogrammetric processes can render a digital terrain model from the images with a vertical accuracy close to the same 3 inches spatial resolution found in the original image collection. IGIS has introduced sUAS and remote sensing training into our workshop schedule for this year. Please check out our IGIS training calendar by Clicking Here for more information. The GIF began in November 2015 on a wave of excitement around geospatial technology. In the months leading up to our first GIS Day in 2005, Google Maps launched, then went mobile; Google Earth launched in the summer; and NASA Blue Marble arrived. Hurricane Katrina changed the way we map disasters in real time. The opening up of the Landsat archive at no-cost by the USGS revolutionized how we can monitor the Earth's surface by allowing dense time-series analysis. These and other developments made viewing our world with detail, ease, and beauty commonplace, but these were nothing short of revolutionary - spurring new developments in science, governance and business. The decade since then has been one of intense innovation, and we have seen a rush in geospatial technologies that have enriched our lives immeasurably. In November 2015 we can recognize a similar wave of excitement around geospatial technology as we experienced a decade ago, one that is more diverse and far reaching than in 2005. This GIS Day we would like to highlight the societal benefit derived from innovators across academia, non-profits, government, and industry. Our panel discussion on the 18th has representatives from several local innovators in the field, including: Stamen Designs, Geowing, PlanetLabs, 3D Robotics, NASA, iNaturalist.org, and Google, who will discuss their perspectives on the boom in Bay Area mapping. Please think about joining us at GIS Day! A bit late, but better late than never. Our October trip to Hopland with IGIS and 3DRobotics was great fun, and very informative. We tested the ‘Solo’ UAV with three different cameras: the typical GoPro, NIR GoPro (with post-market monkeying with filters to get IR), and a high res Canon lens. 3DR’s flight planning software is ridiculously easy to set up and use. 3DR’s new software package can do the mosaicking. 3D models from multiple images seem easy to create. Still want to put a better scientific camera with more bands on the Solo. Still, lots of fun, stay tuned for more pics of data. Check out the webinar: DRONES FOR THE EARTH SCIENCES: APPLICATIONS AND IMPLICATIONS, provided by the Board on Earth Science and Resources. There are also links to the webinar UNEARTHING CITIZEN SCIENCE with Muki Hacklay. The ASPRS Northern California Region is hosting a 2-day symposium on unmanned aircraft systems (UAS) in Reno, NV on October 21-22, 2014. The purpose of the event is to assemble academia, UAS developers, survey and mapping companies, government agencies, and UAS enthusiasts, to share information, showcase new technologies and demonstrate UAS systems in action (in flight). The event will be held at the Reno Stead Airport, an FAA-designated UAS test site, as well as at a symposium hotel in downtown Reno. The mission of the event is to advance knowledge and improve the understanding of UAS technologies and their safe and efficient introduction into our national airspace, government programs and business.